USR Sword & Sorcery impresses with its minimalist nature. The 36-pages-book includes a complete game and an introductory adventure. No setting, though. Get the PDF for USD $1.95 or soft cover for USD $5.65 here (aff). You can create a character within minutes with four attributes. Assign a d10, d8 and a d6 to Action, Ego And Wits. Roll your Action and Wits dice to get your Hits (at least 5). You flesh out your character by rolling on a background table. The entries capture the typical Sword & Sorcery flavor. Then dress up your character with three specialisms. A specialism is tied to an attribute and grants a +2 bonus on a roll. The players can make up their specialisms. You get 3d6 x 10 silver pieces to spend on equipment. Armor is expensive. For example, a hide coat (mitigates 1 Hit on body and arms) sets you back with 600 sp. The game rules appeal with their simplicity. In a normal test, roll an attribute die against a fixed target number. In a contested test both parties roll and higher roll wins. During combat, each character can make one combat action and one movement action. When in melee, you roll your Action die. Your opponent rolls, too. The higher roll is declared the attacker. Then subtract the difference between the rolls from the defender's Hits. That means that there is no separate damage roll. In theory. You still have to roll for hit location. Weapons give a bonus of +1 (e.g. dagger) to +3 (e.g. halberd) to your roll. Armor mitigates damage but you don't subtract it from the roll itself. Ranged attacks are a roll with a fixed target number. For example, the difficulty for short range is 4+ (10 - 40 ft.) and for long range (71 - 200 ft.) is 10+. The nature of the opposed rolls makes for swingy results. Character death can punch in fast. Armor and weapon bonuses count. Are the hit location table, the critical hit and fumble system, and the called shot modifiers necessary? They distract from the mechanical elegance. They don't fit the abstract nature of the system. They lessen the effect of armor. The game comes with a simple experience point system. You can increase Hits and specialisms or gain new specialisms. Attributes don't advance. Dying. On 1 Hit you are unconscious. On a 0 to -3 Hits you must make an Ego roll. The Referee must make up the target number. -4 onwards equals death. Healing. First aid restores 2 Hits. But a full day of rest only gives you 1 Hit back. Interestingly, Carousing restores 2 to 4 Hits. I find the Carousing rules ingenious. Players will turn to Carousing to get back their Hits. They must spend some coin and risk some consequences during excessive partying. The results of too much drunkenness range from the amusing to the painful. They sometimes offer some plot hooks. USR Sword & Sorcery comes with three magic schools: Artifact Mastery, Sorcery, and Imprinting. Descriptions of each include examples for magic items or abilities and general guidelines. Magic also comes at a very steep price. We have encounter tables for wilderness and city encounters. The author also included a mini system for managing the inevitable fire. 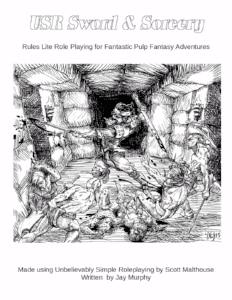 A sample adventure equips the Referee (called Crypt Keeper) to start play without fuss. Plus, it showcases how to build opponents. The layout serves this simple game. Some typos distracted me, though. The mechanisms are easy to grasp. The inherent flaw lies in USR's swingy dice roll mechanic. The author of USR Sword & Sorcery had to add bells and whistles to balance it out. This diminishes the system's elegance. Some rules are vague. At times, I had no clue what the correct procedure was. Are the characters mighty and plow through minions? The system looks too deadly. Or the Referee must stat out foes with low attributes. The sample adventure has them with PC-like stats (d10, d8, d6), though. I like that attacking and defending folds into one roll. Or rather: two rolls, as the opponent rolls at the same time. You might appreciate the flavorful design choices when it comes to healing/carousing. The magic system needs more flesh. Starting characters are not supposed to wield magic. Yet it would be a nice option. For less than a coffee, you'll get a serviceable framework for fast play. Here is the link again: USR Sword & Sorcery (aff). P.S. For other rules-lite Sword & Sorcery games take a look at Blood Of Pangea, Sharp Swords & Sinister Spells or Sorcerers & Sellswords. P.P.S. The basic USR 2.0 rules (aff) are Pay What You Want.